Your first day in Java tends to be a bit of a culture shock, especially for us after two months in Australia and New Zealand. We'd hit a similar shock in Thailand a few years ago and this time wanted to make our arrival day as smooth and simple as we could. Fortunately we found the lovely Wayang Homestay via Airbnb who included an airport pick-up with the stay, so when we arrived at the airport we didn't have to worry about finding public transport or dealing with taxis and touts and instead were guided to an awaiting car by two friendly nieces of the homestay owner. 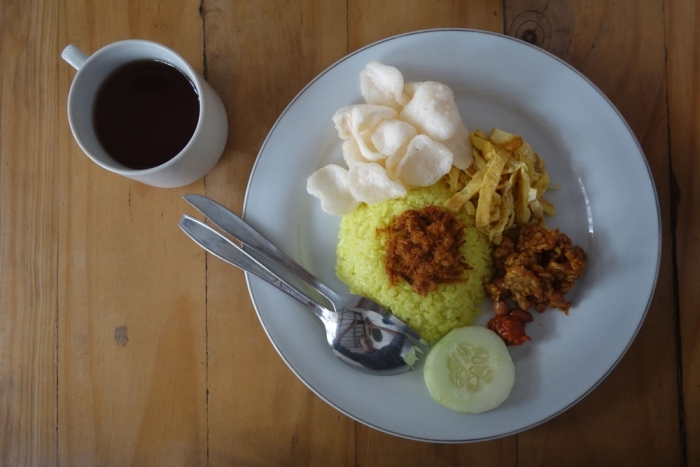 Whereas homestays are normally thought of as someone simply renting out a room in their otherwise normal house, in Indonesia they are much closer, if not identical, to bed and breakfasts or guesthouses elsewhere. We had our own lockable room with an ensuite bathroom, TV, independent air conditioner and breakfast in the morning. The standard will obviously vary from place to place but they are a really good option for budget stays throughout Indonesia. A traditional Indonesian breakfast; "Nasi Campur"
We'd originally chosen Yogyakarta Airport in order to avoid the worrying reputation of Jakarta Airport (and also because there wasn't much between the two cities that we wanted to see). Despite being better, the airport is still an experience to navigate. The first tripping point as soon as we went through the door of the terminal from the plane was an immediate USD35/person charge for the visa which we saw a few worried tourists caught out by. Luckily we had known to bring the amount with us but I'm not sure what would happen if you didn't have it (we didn't see a card machine but may have missed it). You buy the visa from what looks like a ticket booth to the right of the door as you enter. Once you have this, you queue through the immigration desks (nothing too bad here - just standard questions) to pick up your bag from the pile of luggage deposited in the corner. Finally you join the queue of travellers to get your bag scanned by customs on the way out of the airport. All of this happens in a really small room so there is a bit of chaos! Another thing to watch out for - after immigration (so before the customs scan) there are people who look official who will offer to help carry your bags (or just grab at it) who will then ask to be paid for doing so. Unless you are feeling particularly lazy, it's probably best to keep hold of your bags to avoid this. You can see why, after the chaos we were happy to see the smiling faces of our pick-up people! Wayang Homestay, our accommodation for the 2 nights we were spending in Yogyakarta is located in the south of the city (near the corner of JL Minggiran and Jelan Mayjen Dl Panjaitan). We were only staying in the city for a short time to give us an opportunity to take a tour to the Prambanan and Borobudur temples before we headed onwards, so the homestay was perfect for us but I suspect that we weren't in the most touristy area of the city so if you want to stay there longer, there may be better areas to investigate. Having arranged (through the homestay) the temple tour for the next day with a company called Kresna, we decided to go for a walk around the area and up to the palace which was about 15 minutes north. By the time we got there however we discovered to our disappointment it was closed for the day (it shuts at 2pm) so instead were content to simply continue our walk around the city. 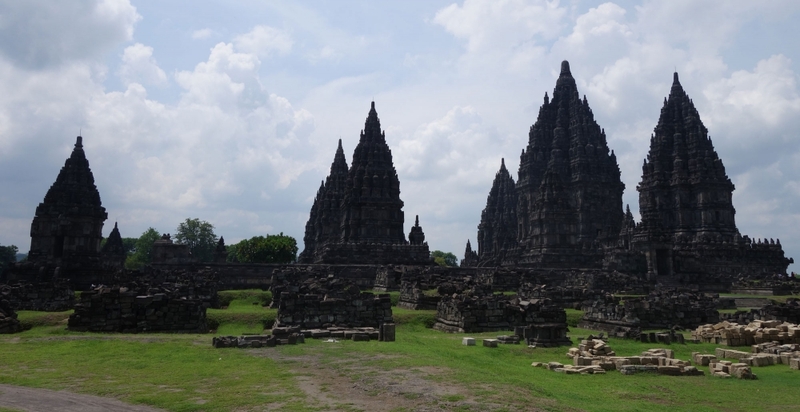 The Prambanan and Borobodur temples are two groups of temples within driving distance of Yogyakarta. The best way to see them is by arranging to be part of a tour between both sites. 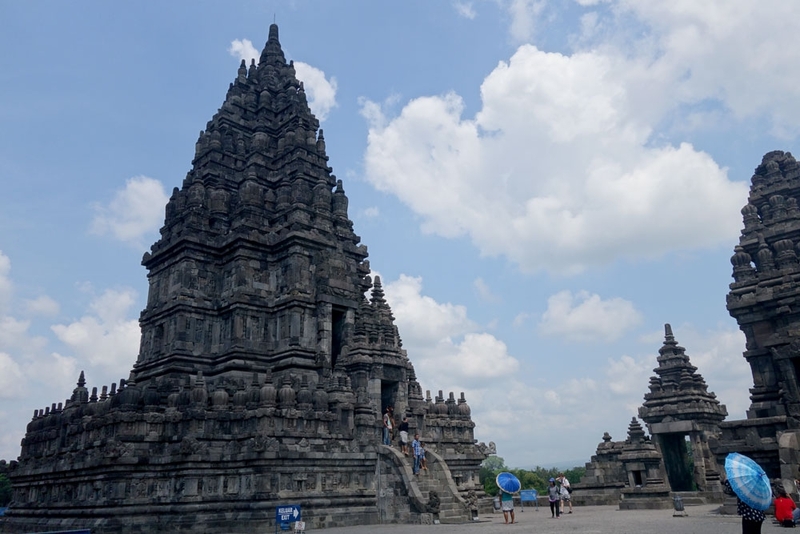 It is worth noting that each site has an additional entry fee and, unless specified, your tour price (we paid IDR150,000/~GBP7.50 each) will not include entry. 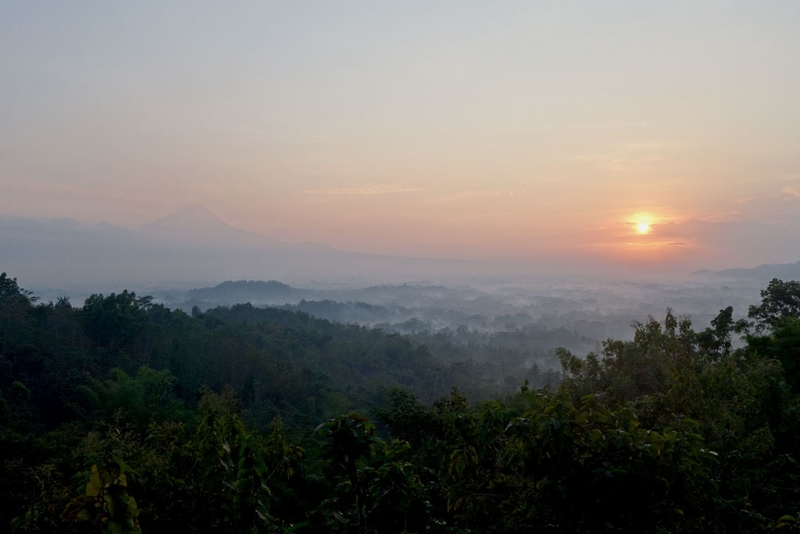 We opted for a sunrise tour which added a third site - a view from a mountain overlooking Borobodur - to watch the sun rise. 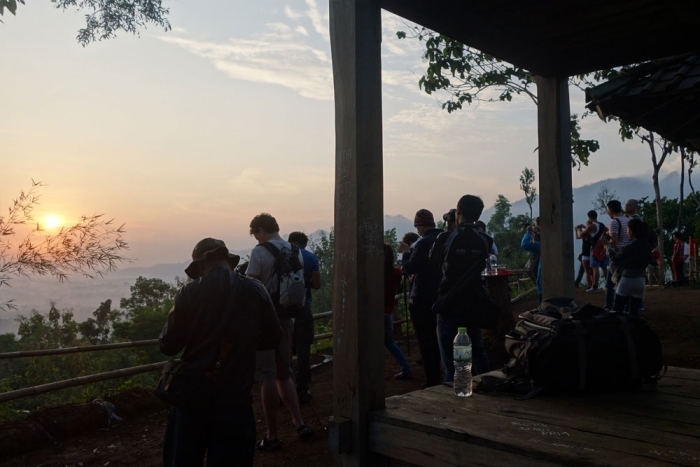 You had to be up for 3am and there was had an additional IDR30,000 fee at the bottom of the steps but the view from the top with the mist in the valley was superb. 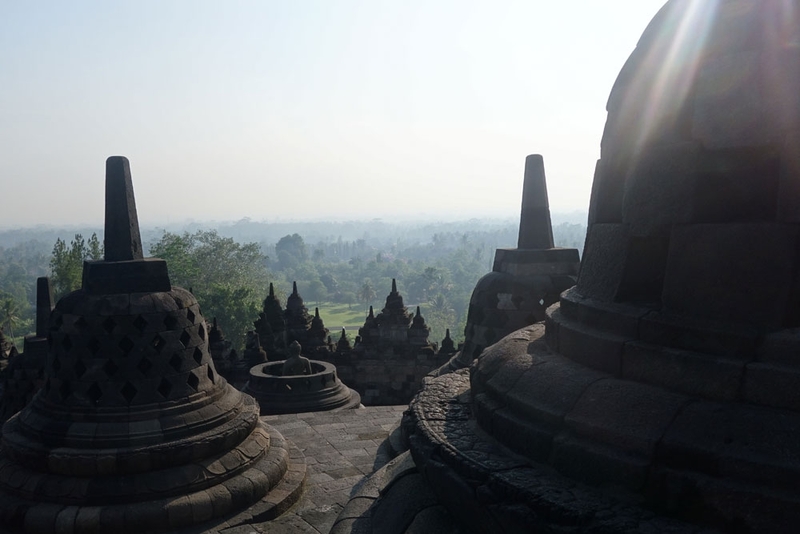 Borobudur is the world's largest Buddhist temple, completed some time between the 8th and 9th century. It is a single, large pyramid-like structure covered in carvings and Buddha statues. Tourists can walk the grounds up to the temple and also climb up through its levels to walk round and see the carvings on each side. Entry here cost IDR230,000 but our bus driver said he would cover the cost of the two temple tickets for a lower price so, although suspicious as to the mechanism by which this was achieved (I suspect he just back-handed the guards to let us through), we accepted. 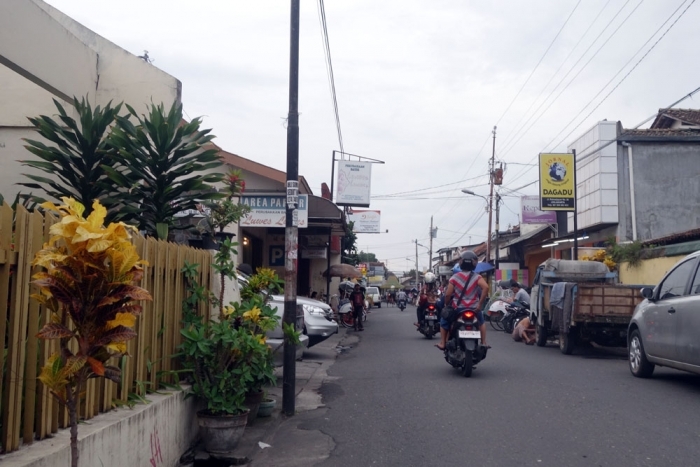 I would very much recommend that anywhere you go in Indonesia, have googled the entry fees before you start - people will start throwing deals and numbers at you before you can find an official price list (if one even exists) and it is worth having some numbers in your head before-hand. Normally, to my surprise, I've found the prices offered aren't more expensive than the official ones and sometimes you could consider accepting it as a 'tip' for the driver but if in doubt, don't be distracted from going to the official desk. Also - push for a receipt for everything if you can - you don't want to end up half way through a journey and be refused a transfer because you don't have a relevant ticket and can't prove you paid for it. An experience we hadn't expected was that we would become the attraction for groups of school children visiting the site. There was one moment in particular that a megaphone-wielding teacher openly pointed us out to his class, while they took photos. We also found smaller groups of school kids following us around with cameras and one brave one who managed to get us to say yes to a photo with them. If you want a feeling of either being a celebrity (or a zoo animal) this is a great option! 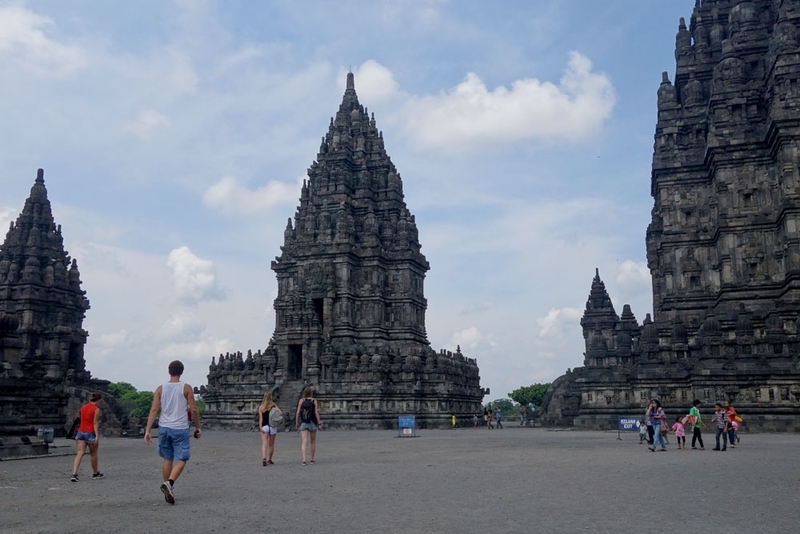 Whereas Borobudur was Buddhist, Prambanan is a Hindu temple compound - the largest of it's type in Indonesia - and a UNESCO World Heritage Site. 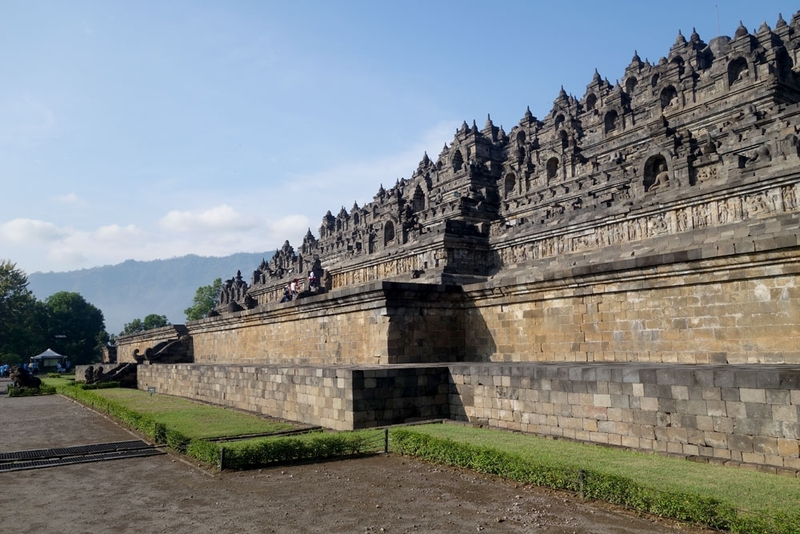 It is a very different to Borobudur, with lots of separate, more pointed buildings rather than the single monolithic one so it is a great contrast. Be sure to read the information panels before the entrance to get the full details and beliefs associated with the main shrines. 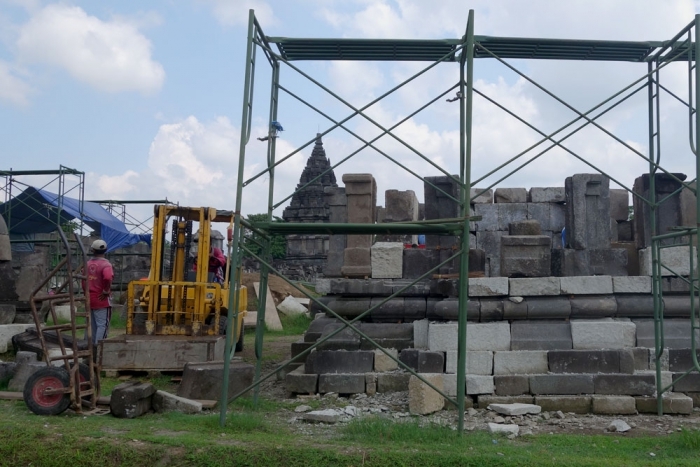 Although severely damaged by the 2006 Yogyakarta earthquake, the site is being restored again with work continuing even as we were there. 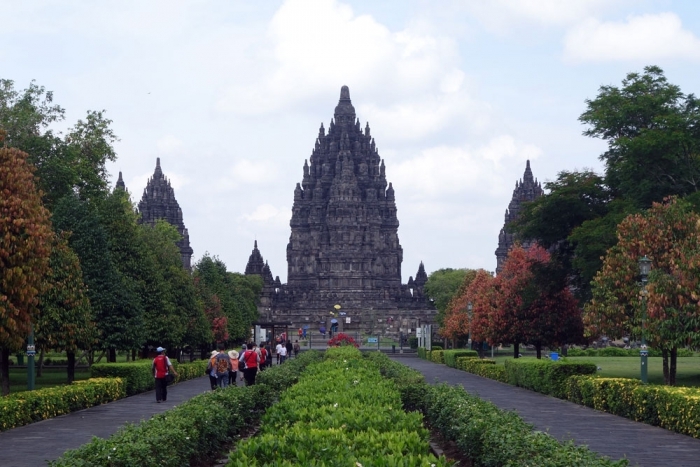 Entry to the site came to just over IDR200,000 per person (I've lost the exact number). For us, again due to the arrangement with our driver, this entry was covered by him. 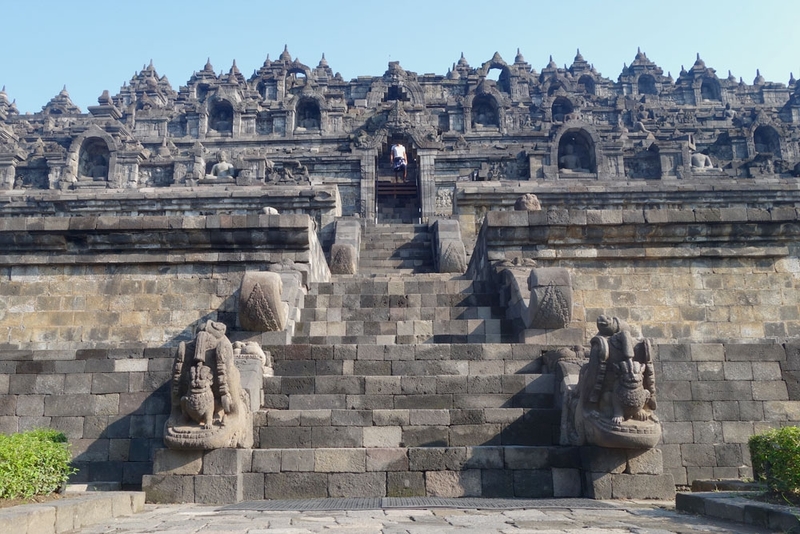 Something else worth noting - although you are able to go inside the temples, the main attraction is certainly the outside of the buildings - the inner parts tended to be simply a single room, sometimes with nothing in it and other times with one or more statues. All in all a pretty productive day out and an interesting insight into how even organised tours in Indonesia can be a little shady! Now for us to see what a full, 2-day tour to Mount Bromo is like!